Core Tax Legislation & Study Guide 2016 makes it easy for students to stay across tax changes by providing all the key tax provisions they need in one handy volume. This compilation is divided into three parts:Part 1 is a Study Guide, providing advice for students on research techniques, tips for writing assignments and preparing for exams, and includes list of useful websites for further reading.Part 2, the largest section of the text, brings together extracts from relevant income tax, goods and services tax, fringe benefits tax and superannuation, as well as related legislation and regulations. 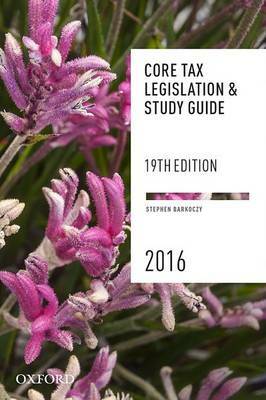 It provides students with up-to-date access to the legislative provisions required in a tertiary taxation law course.Part 3 contains a Legislation Index, covering the core tax legislation provisions of Part 2.Core Tax Legislation & Study Guide 2016 can also be used in conjunction with Foundations of Taxation Law, Australian Taxation Law, the Australian Tax Casebook and the Australian Master Tax Guide.New to this Edition:The 19th edition incorporates all amendments to 1 January 2016.